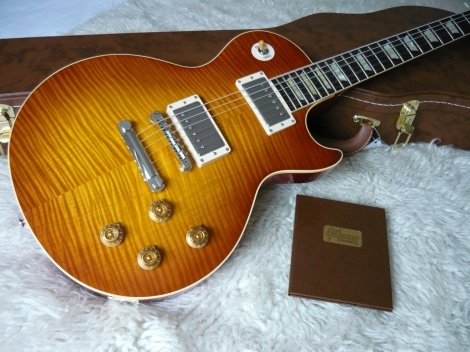 Guitars Rock - NZ's Online Guitar Shop obsesses over guitars, are proud to bring you this 2014 GIBSON LES PAUL 1959 Reissue - Sunrise Teaburst - Gloss. Genuine made in USA. Slightly used, mint condition. Guitars Rock imported this R9 from USA brand new in May 2015, one owner. The best guitar on the planet IMHO. Pure Gibson Mojo and history. Incredible tone, sounds killer, amazing natural sustain, creamy rhythm and hot molten lead sounds. The Cadillac of the Les Paul family, meticulously handcrafted at the Gibson Custom Shop. To revive the very essence of the original 59 Les Paul, Gibson Custom spared no expense, painstakingly recreating each part of the 1959 Les Paul Reissue piece-by-piece. The original non-weight-relieved mahogany body, hand-carved and bookmatched maple top, and holly-head veneer headstock are only the beginning. The accuracy of the details go all the way down to the straight-line positioning of the 1959 Les Paul Reissue VOS's Kluson Green Key tuners, the size and shape of the acrylic trapezoid block inlays, and the '50s-style long neck tenon joint. The Custom Shop 1959 Les Paul Reissue Gloss sports a pair of Gibson's CustomBucker humbuckers. The CustomBucker is the most historically accurate PAF copy ever. Gibson Custom paid just as much attention to the 1959 Les Paul Reissue electronics as they did to its aesthetics. Beginning with vintage CTS potentiometers and bumble bee capacitors, every part of its internal signal path is designed to give you absolutely dead-on '59 Les Paul tone. Hardshell case and Certificate of Authenticity included.